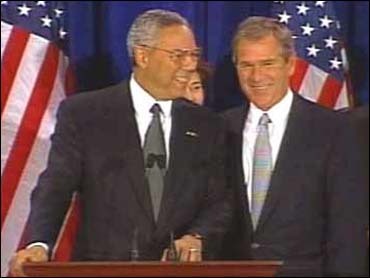 A year ago President George W. Bush and Secretary of State Colin Powell were speaking out, attempting to explain to audiences at home and abroad the administration's policy on going to war in Afghanistan to oust the ruling Taliban regime and al-Qaeda terrorists. Now Mr. Bush and his senior national security team are once again speaking out in an orchestrated way, this time laying out the case against the regime in Baghdad. White House and State Department officials point not to one single speech or event, but to a series of activities which have already started and which will continue as part of an effort to convince various "publics," as one official put it, that Saddam Hussein must go. First, the American public and its opinion makers must buy the administration's argument that Saddam must go, and go now. Especially since it means sending in the U.S. military to make it happen. The veto-wielding members of the U.N. Security Council, who so far are still opposed to the American strategy — France, Russia and China — have to be won over. The Muslim world has to be persuaded Mr. Bush's Iraq policy is not anti-Islam, only anti-Saddam. And America's European allies still have many unanswered questions, such as "why now" and whether the use of preemptive force is the way to go. One very important group, the U.S. Congress, has been won over by the administration's arguments. Secretary Powell predicted such an endorsement "will definitely strengthen my hand " as his attempts to forge a consensus on a resolution at the U N continue. The opening round of this sales campaign came last month, when the White House issued a document called "A Decade of Defiance and Deception" which catalogued Iraq's non-compliance with past United Nations resolutions. That was followed by several major policy speeches given by Mr. Bush, first to the U.N. General Assembly and then, earlier this week, to civic leaders in Cincinnati. Overseas, the message is being spread by the State Department which broadcast the Cincinnati speech -- in Mandarin, Russian, French, Spanish, Arabic and Portuguese -- to its embassies worldwide, leaving it to each mission to show to local audiences and opinion makers. Secretary Powell has also spoken out, from podiums at the U.N. and the State Department, and to private groups such as the U.S.-Russia Business Council. But these are only the most formal and official forms which the sales campaign is using. The White House has established an Office of Global Communication which will coordinate the overall effort to get the administration's message out. Working with the State and Defense departments, it will work to educate publics abroad and counter Iraq's disinformation campaign. One White House official described various events, speeches and release of documents as all part of a series. "You turn up the burner from time to time, and raise the temperature ... but we never try to bring it to a boil." One State department official said the administration has to coordinate their strategy. Otherwise, he said, U.S. voices "often are not heard; it becomes others interpreting U.S. policy." One way to counter that problem is to have senior officials such as Powell appear on programs like CNN's Larry King Live (which happened this week) which will be seen worldwide in an unedited way. The administration also will be providing senior officials for appearances on Arab television networks like al-Jazeera and newspapaers like the London-based Al-Hayat. "The Islamic media are significant," the White House official said, " and they will continue to get more attention." One lesson learned from the past is to use foreign service officers who are fluent in arabic. But all sales campaigns have their problems and this one is no different. One official put it candidly, and left out the usual Washington spin: "to have an effective advertising campaign, you have to have a product somebody wants, and right now we're trying to figure out if anybody wants our product." By the time Mr. Bush and Mr. Powell get the Congressional and U.N. Security Council resolutions they need, everyone, even the skeptics, will be on board and have their marching orders. When it comes to selling foreign policy from Washington, it's not very different than selling cars in Detroit: it helps if everyone is singing from the same sheet of music.